Cortright metal shingles - Oriental - Roof Menders, Inc. The metal shingle design called Oriental from Cortright Metal Roofing of Philadelphia is still around today. For example here is the finished restoration work on a project south of Washington, DC. By 1915, which was late in the embossed tin shingle era, only one size was available. The shingles measured 10″ x 14″. 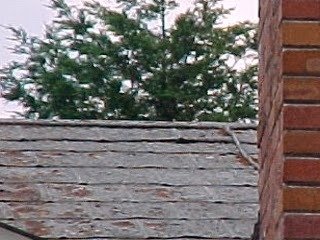 Pre-1900, usually the shingles were available in three sizes, probably called small, medium and large. The shingles, in their individual application, could expand and contract with changing temperatures, thereby assuring the owners of a weatherproof roof. These shingles represent a feature of the later period: combining several shingles into a layered sheet. 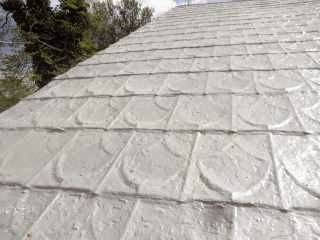 With modern coatings, these roofs can be saved, particularly since the roofs rarely leak. Here is a before photo of the shingle roof above. As you will see on a webpage of this project, this gem is located on a rural home, owned by a couple who just enjoy living there.